Schneider is the founder of Parents Who Rock, a wide-ranging organization inspiring Montclair dads and moms to excavate their closeted electric guitars and shoebox-entombed microphones and again take the stage. She’s leading many PWR members to participate in fundraising efforts to construct a universal playground in Edgemont Memorial Park that will enable children and adults who have physical limitations to have fun alongside non-disabled kids and grownups. As envisioned, the playground will cost approximately $350,000, of which $200,000 in public funding is available. 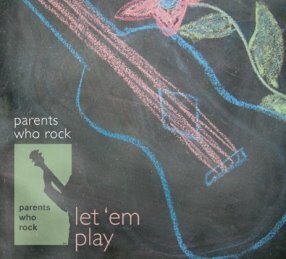 Parents Who Rock is in the forefront of a Montclair-and-beyond effort to raise $150,000 in donations to get the outdoor facility built. “There’s a reason for building a universal-access playground,” Schneider said. “These parks are few and far between. People or their kids who have disabilities really need the opportunity to play together. Schneider has assembled her own playground of aspirations to raise the money. She organized the recording of a CD, “Go Play Outside,” by an assemblage of PWR players. The CD is being sold for $10 in numerous Montclair businesses, with all profits slated for creating the all-children’s playground. She’s connecting with local public and private schools. Schneider foresees the Montclair School District this spring sponsoring a workshop “where every single class in Montclair will be discussing differences and disabilities. Schneider’s reached out to the Junior League of Montclair-Newark. In March, Montclair Kids in Action intends to conduct a walkathon/bike-a-thon/skate-a-thon in Edgemont Memorial Park “to raise awareness” about the physical limitations affecting many people and the need to be understanding, Schneider said. As a member of the Montclair-based culinary/social organization Cooking With Friends, created by Alison J. Bermack, Schneider intends to gently entwine Bermack’s wide-ranging community of members into generating funds for the playground. In March, PWR and several local businesses will sponsor “bake sales all over town.” Three local bakeries — Gimmee Jimmy’s Cookie Bar on Church Street, Flour Patch Bakery on Greenwood Avenue, and Baking Fiend, bakingfiend@fmail.com — will donate delicious delights. She has reached out to professional musicians to gain their backing for upcoming endeavors or simple plugs of support. Radio stations such as WFMU have broadcast cuts from “Go Play Outside” with the requisite mention of its fundraising focus. 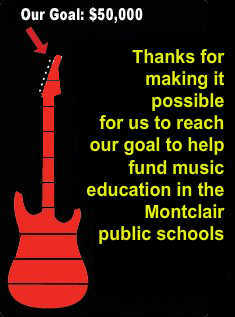 Schneider has even ordered PWR “Rock Montclair” T-shirts, with the profits going to the playground fund. She promises that other fundraising efforts are in the works.